Cosy holiday apartment in an extensive garden belonging to a villa, lived in by the owners in the countryside of S. Agata sui due Golfi. Cosy holiday apartment in an extensive garden belonging to a villa, lived in by the owners in the countryside of S. Agata sui due Golfi. Ideal position for excursions to the main resorts along the Amalfi coastline as well as that of the Sorrrento coastline. Panoramic view over the sea. The apartments on the estate have either a garden area or a private terrace. Shared with all apartments on the grounds: an above-the-ground swimming pool. Accommodation (70 m2) Gr. fl. : living/dining room with kitchen corner (microwave, freezer, washing machine), hall area, 1 double bedroom, 1 bedroom with bunk beds, 1 bathroom with shower. The room with bunk beds has no windows, only a small air intake. Equipped garden (180 m2). Air conditioning (hot and cold). Location: 1 km S. Agata sui due Golfi (various shops, swimming pool, tennis), 8 km Sorrento, 10 km Marina del Cantone and Massa Lubrense (beaches), 13 km Positano. The agent has rated it as a three star property so it is a well-kept apartment, equipped with standard furniture. It is also good value for money. 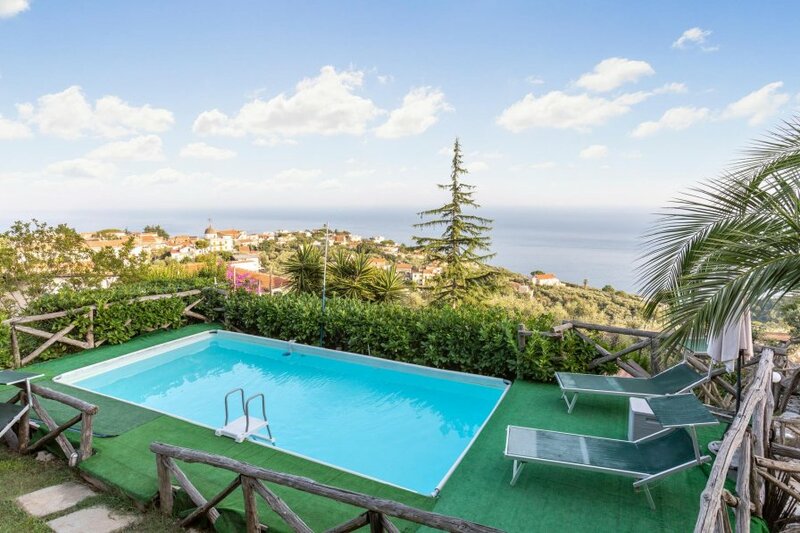 This apartment has use of a shared pool and is located in Massa Lubrense, only 1km from Sant'Agata sui due Golfi. It is set in a good location: there is a restaurant 1km away. You can also park on-site at no extra charge. The apartment is well equipped: it has a refrigerator, microwave and washing machine. It also has some garden furniture outside.